The US dollar had a successful week, rising against most currencies thanks to a hawkish move from the Federal Reserve. German Ifo Business Climate, Inflation data in the UK, US consumer sentiment and housing data as well as jobless claims are the highlight events . Here is an outlook on the main market-movers this week. German Ifo Business Climate: Tuesday, 9:00. German business sentiment edged up in February to 111.3 from 110.6 in January. The release was better than the 110.7 predicted by analysts. The rise suggests that economic recovery is continuing to improve despite some weak figures in exports and industrial output. The survey shows retailers are more satisfied with current economic conditions and consumer spending is rising. A small decline to 110.9 is predicted this time. UK inflation data: Tuesday, 9:30. Inflation in the UK fell in January to 1.9% from 2.0% in the previous month due to lower tobacco prices. The rate declined below the Bank of England's 2% target for the first time in more than four years. In the first half of 2013 inflation nearly reached 3.0% but descended in the second half of the year. Prime minister David Cameron commented that this fall in inflation is further evidence that UK’s economic plan is working. Low inflation enables future planning without surprises. Another decline to 1.7% is anticipated now. US CB Consumer Confidence: Tuesday, 14:00. Americans were more pessimistic about the US economy in February according to the Conference Board survey. Consumer confidence declined to 78.1 from 79.4 in January, contrary to predictions for 80.2 points. The Expectations Index, fell to 75.7 points in February from 80.8 January's 80.8. Responders were concerned over the short-term outlook for business conditions, jobs, and earnings. Meanwhile, current conditions assessment has improved. Consumer confidence is expected to improve to 78.7. US New Home Sales: Tuesday, 14:00. New U.S. home acquisitions edged up to a 468,000 annualized pace in January, exceeding forecasts of a 406,000 reading. This five year high release was preceded by 427,000 in December, indicating the housing sector remains strong despite recent falls, even in the midst of unusually cold weather. If the job market continues to improve, the housing sector would return to solid growth. Home sales are expected to reach 447K this time. US Durable Goods Orders: Wednesday, 12:30. Orders for long-lasting U.S. goods excluding transportation unexpectedly climbed 1.1% in January following a 1.9% plunge in December, suggesting factory activity may yet improve despite recent falls. However, durable goods fell 1.0% in January after posting a 4.3% fall in the previous month. Nevertheless, the harsh weather conditions had a big role in the recent industrial decline. The manufacturing sector is expected to do better in the coming months. A small rise of 0.3% is anticipated this time. US Unemployment Claims: Thursday, 12:30. US jobless claims rose less than expected last week, increasing 5,000 to 320,000 Analysts expected claims to reach 327,000. The four-week moving average declined by 3,500 to 327,000. Continuing claims increased to 2,889,000, compared to a downwardly revised 2,848,000 recorded a week earlier. The better than expected release suggests the weak Non-farm payrolls release was a onetime event affected by the cold weather. Jobless claims are expected to reach 326,000. US Pending Home Sales: Thursday, 14:00. Contracts to buy existing U.S. homes edged up 0.1% in January after a 5.8 drop caused by unusual winter storms, harsh weather and limited inventory. This small scale rise was less than the 2.9 climb anticipated by analysts. Nevertheless, conditions are expected to improve in the coming months despite tight credit conditions. A further rose of 0.2% is expected now. The British Pound may face a larger correction in the week ahead as the headline reading for U.K. inflation is expected to narrow to an annualized 1.7% in February, but we will retain a constructive view for the GBPUSD as the Bank of England (BoE) sees a ‘broadening’ recovery in 2014. A further slowdown in U.K. price growth may limit the BoE’s scope to move away from its easing cycle as Governor Mark Carneysees the spare capacity in the U.K. economy slight above 1.5%, and a dismal CPI print may push the GBPUSD back towards the 1.6400 handle as the pair continues to search for support. Nevertheless, the BoE Minutes suggests that the central bank will continue to prepare U.K. households for an imminent rise in the benchmark interest rate amid the stronger recovery, and it still seems as though the Monetary Policy Committee (MPC) will do little to halt the advance in the British Pound as it helps to balance the risks surrounding the region. With that said, the policy outlook should help to limit the downside risk for the sterling, and we may see a growing number of central bank officials push to normalize monetary policy sooner rather than later as former Deputy Governor Charles Bean argues that the BoE may wind-down its balance sheet by allowing its Gilt holdings to mature. As a result, the 1.6400 handle may serve as key support as we have a handful of Fibonacci levels coming in around the figure, and we will revert back to the ‘buy the dip’ approach once the GBPUSD finds support amid the series of higher highs & higher lows in the exchange rate. 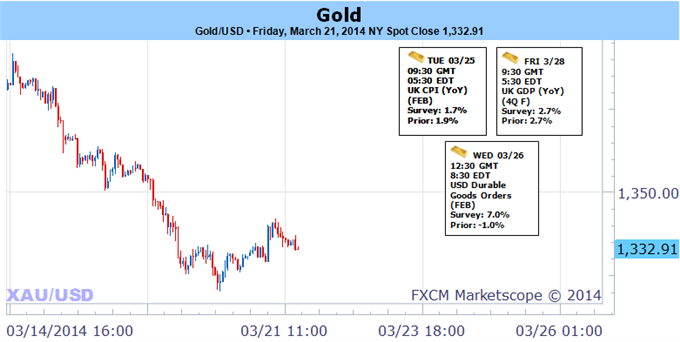 Gold Finds Reaction Area; End of Week Bounce? Gold saw the largest weekly decline in four months this week with the precious metal off by more than 3.4% to trade at $1335 ahead of the New York close on Friday. The week began with a technical reversal off six-month highs ahead of the FOMC policy meeting on Wednesday which proved devastating for the bulls. While the Fed impact this week is a slight shift against the gold trade, the technical impact on prices may have a more lasting effect. The central bank continued with its taper plans this month, cutting back the pace of Treasury & MBS purchases by $10billion to $55Billion per month. While the move was widely expected, a change in the language of the accompanying policy statement and the subsequent press conference with Fed Chair Janet Yellen saw the biggest impact on markets. The committee elected to leave out the 6.5% unemployment threshold, noting their “assessment will take into account a wide range of information, including measures of labor market conditions, indicators of inflation pressures and inflation expectations, and readings on financial developments.” The shift into a more qualitative assessment coupled with the quarterly projections from the committee members does slightly pull forward interest rate expectations but continues to offer little clarity as to specific metrics the central bank will want to see before deciding to normalize policy. With concerns over the geopolitical risks posed by the ongoing situation in Ukraine taking a back seat, gold remains vulnerable- especially in light of this week’s developments. Yellen’s tone is likely to keep the inflationary trade at bay for now and outside of a more profound risk sell-off, topside advances should remain limited. Heading into next week, traders will be closely eyeing US housing data including New Homes Sales & Pending Homes Sales and the third read on 4Q GDP. Consensus estimates are calling for an upward revision to fourth quarter growth to an annualized rate of 2.7% q/q, up from 2.4% q/q. Look for positive US data prints to continue to weigh on the gold trade to the benefit of the greenback. From a technical standpoint, gold has not put in an outside reversal week with prices closing just above the 52-week moving average. The move back below the initial March opening range high now puts into question a false break scenario of the trendline dating back to the 2012 we saw last week. That said, although our broader outlook has shifted back down to the short side of gold we remain prudent while above the March low / open at $1225 with a close below needed to validate the turn in our medium-term outlook. Bottom line: the gold trade remains at risk while below $1357 with only a move surpassing this level putting the focus back towards the monthly highs. The US Dollar finally showed signs of life as a surprisingly-upbeat Federal Reserve sent it sharply higher versus major counterparts. Yet key headwinds remain, and a number of factors suggest that buying USD makes little sense at these levels. The US Federal Open Market Committee (FOMC) had a lot to say about current economic conditions and matched market expectations as they announced a further “Taper” of their Quantitative Easing policy. Yet it was a noteworthy shift in interest rate forecasts that really sent the Dollar higher, and indeed market correlations suggest yields may remain the most important USD driver through the foreseeable future. Traders showed little hesitation post-FOMC and sent the 2-year US Treasury Note yield to its largest single-day advance since it set its modern-day low nearly four years ago. And yet the lack of follow-through the rest of the week left the US currency vulnerable. Indeed, the Dow Jones FXCM Dollar Index (ticker: USDOLLAR) failed at late-February highs as Treasury markets stabilized into end-of-week trading. What’s next? An effectively empty US economic calendar in the days ahead gives little reason to expect major shifts in interest rate expectations or the US Dollar itself. In fact, forex volatility prices now trade near their lowest levels since the onset of the global financial crisis in 2007. Muted forecasts give little reason to expect that the Greenback will trade significantly higher through the foreseeable future. Thus traders should be wary of buying the US Dollar as it trades near important technical resistance versus the Euro, British Pound, and other counterparts. A substantial shift in market conditions—particularly in highly-correlated US Treasury markets—could obviously change our stance on the Greenback. As traders we’re forced to think in terms of probabilities; current evidence tells us to expect few major moves through the final week of March. Half of the most liquid yen crosses closed out this past week in the green. Though, that should provide long-term bulls little relief. So far in 2014, this once high-flying group is under water. The forces that provided the momentum of 2012 and 2013 – a reach for yield and the introduction of a massive stimulus program from the BoJ – have been sidelined. And now, fear is creeping in that there is a very real risk that speculative appetites are starting to wilt and the central bank is shelving plans to upgrade its QE plans. While neither theme is threatening to collapse – yet – the yen crosses may still topple (yen rally) in the absence of further expansion. Some markets and themes default to a certain bias. The S&P 500 is a great example whereby it naturally rises in the absence of conflicting fundamental catalysts due to the chase for returns over the last five years. At one point, the yen crosses shared that innate momentum, appreciating off the back of speculative appetite – some see it inversely as a lack of fear – and the afterglow of the Bank of Japan’s (BoJ) sizable stimulus upgrade. Yet, both of these drivers are losing power and it is proving increasingly difficult to connect them to this carry trade. If indeed we are running out of hot air to keep this balloon up, the market will quickly recognize how high we are. We are currently between 40 and 15 percent above the levels the yen crosses were lurking before the market began its run up in anticipation of the open-ended stimulus program. That is a hefty premium, particularly when we look for a fundamental valuation familiar to these pairs – carry. Whether we use benchmark rates, government bond yields or further-from-prime market returns; we find the ‘carry’ on crosses are still historically low. The deviation between this underlying worth and current market rates is extreme, and an ominous liability. This is especially true when we note the long-standing congestion in pairs like USDJPY or that implied (expected) volatility for the same pair over the coming month has dropped to its lowest level since November 2012. These are potentially explosive conditions of complacency. A return to trend for the yen crosses would be best accomplished by revitalized risk trends...bullish or bearish. Here there is an imbalance. While we are still riding on a multi-year investment wave, even the long-term bulls are talking saturation and the need for a correction with economic conditions cooling. Risk aversion, on the other hand, taps into conditions of excessive leverage, concentrated exposure and low levels of participation. In other words, a deleveraging could prove violent for capital markets and yen-based carry trades. Yet, this is a risk that has lingered at the fringes rather than fully materializing. We should not lose sight of the threat of risk aversion, but recent history has proven it is costly to try and preempt it. Where risk aversion would be the most decisive and effective catalyst for resolving this tense, meandering situation; we may find monetary policy the more likely source. In just a few weeks time, the BoJ is expected to hold the first of two policy meetings scheduled for April. This time last year, the central bank introduced its current open-ended stimulus effort. Not long after the program was inducted, speculation of a further increase was priced in. Over the past months, that expectation has deflated significantly. Central bank members have repeatedly voiced confidence that the economy would meet its inflation target and the economic impact of the upcoming tax hike would be transitory. Policy officials are deliberate in their remarks as they acclimate the markets ahead of change. The BoJ’s lean seems clear. The fundamental prospects for the yen crosses are building pressure rather than shaping progress – in large part because they contradict holdover complacency. A break out – bullish or bearish – from congestion for USDJPY and the other yen crosses is inevitable. But as with anything in trading, success is in the timing. Fed Chair Janet Yellen, hinted about a rate hike in the spring of 2015 causing a multi-layered USD rally. Positive US data released at the end of last week backed the Fed’s intentions. Philly Fed Manufacturing Index rebounded to 9 points in March. Furthermore, US weekly unemployment claimsrose less than expected to 320K, continuing the recovery process in the US labor market. But are we seeing a serious change or will her words be watered down? 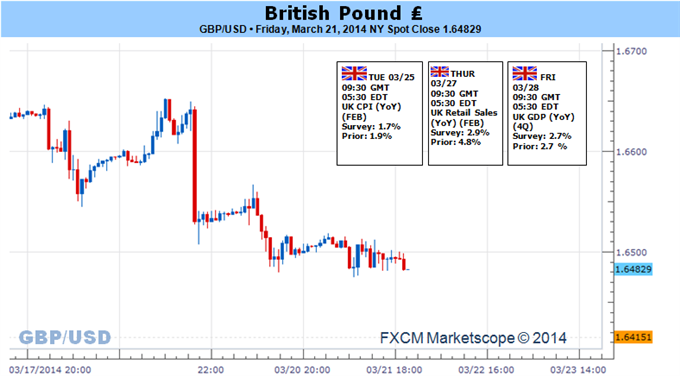 The biggest victim was CAD, which reached a new multi year low, and also GBP/USD suffered. EUR/USD was also hit by disappointing German data. The yen enjoyed the Ukraine crisis and the kiwi showed its own strength. UK inflation data: Tuesday, 9:30. Inflation in the UK fell in January to 1.9% from 2.0% in the previous month due to lower tobacco prices. The rate declined below the Bank of England’s 2% target for the first time in more than four years. In the first half of 2013 inflation nearly reached 3.0% but descended in the second half of the year. Prime minister David Cameron commented that this fall in inflation is further evidence that UK’s economic plan is working. Low inflation enables future planning without surprises. Another decline to 1.7% is anticipated now. US CB Consumer Confidence: Tuesday, 14:00. Americans were more pessimistic about the US economy in February according to the Conference Board survey. Consumer confidence declined to 78.1 from 79.4 in January, contrary to predictions for 80.2 points. The Expectations Index, fell to 75.7 points in February from 80.8 January’s 80.8. Responders were concerned over the short-term outlook for business conditions, jobs, and earnings. Meanwhile, current conditions assessment has improved. Consumer confidence is expected to improve to 78.7. 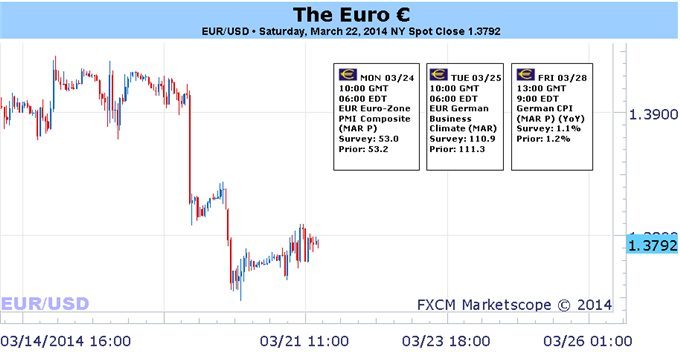 - The Euro has had a rocky few days after ECB President Draghi warned on Euro strength. - The midweek EURUSD triangle was resolved after the FOMC rate decision. The Euro’s bullishness halfway through March hit the proverbial skids this week as the Federal Reserve’s rate decision provoked a sharp snapback in the EURUSD, dragging down other EUR-crosses in the process. Amid a week where the calendar was largely absent of significant economic data, it was this foreign-borne event that proved to be the strongest influence on the single currency over the past five days. The appearance of a more hawkish FOMC – anointed on Fed Chair Janet Yellen’s slip of the tongue that the first rate hike could come around six months after QE3 was fully tapered – has helped further recalibrate the needle for the EURUSD.Just two weeks ago the European Central Bank made clear it was intending to stay on the sidelines as growth crept back into the picture and crisis conditions remained at bay. This perceived hawkish ECB was complemented by weak US economy data, leading to speculation over a more dovish FOMC. If the prior underlying sentiment in the market was for a patient ECB and a nervous Fed, the script has flipped over the past two weeks leading us to a much less optimistic view of the EURUSD specifically, and now the Euro overall. Rather than staying on hold,ECB President Mario Draghi has warned that the elevated Euro exchange rate has been hampering growth. For the Fed, it’s clear that the weakness in data seen the past few weeks (“the weather”) wasn’t enough to spur a dovish shift; the Fed and the ECB have had their respective roles seemingly reversed very recently. The Euro may be especially vulnerable for a larger snapback now that central banks sentiment has been primed for a weaker EURUSD in the near-term. As always, given the reality of the ECB’s position – it is firmly on hold – a downturn in European economic data will be necessary for any serious Euro weakness to snowball. Already this past week it was revealed that Euro-Zone inflation slipped back to a post-2008 crisis low of +0.7% y/y, the level at which the ECB most recently decided to cut its main refinancing rate in November 2013. Economic data out of the Euro-Zone has been starting to disappoint generally, with the Citi Economic Surprise Index falling to +6.9 by March 21, the monthly low. While this remains above the index’s yearly low of -0.8 set on February 26, it is well off of the yearly high seen on January 28 at +30.3. Data momentum looks to be under further pressure this week with the various PMI readings for March due, with the Euro-Zone Composite, German Manufacturing and Services readings all set to decline from their February levels. In terms of funding stresses, interbank lending rates remain below the ECB’s overnight reference rate (0.25%) but signs of modest pressure are starting to show. While settling at 0.163% on Friday, the 20-day average EONIA rate was 0.169%, up from 0.156% one-month early (February 22), and up from 0.149% three-months earlier (December 20). With LTRO repayments ongoing, a further reduction in excess liquidity alongside softer economic data –exacerbated by renewed speculation over the Fed winding down its stimulus measures sooner than expected – could support a state of elevated lending stresses. If the market’s fear of the ECB grows amid the recent flip in central bank narrative, with speculators now the most bullish the Euro since the week ended October 29, 2013 (CFTC’s COT data shows Euro longs increased by +45.6% to 52,991 contracts for the week ended March 18, 2014) the perfect mini-storm for Euro weakness over the coming days and weeks may be developing. The Australian Dollar continues to look to external catalysts to take top billing over a relatively quiet domestic economic calendar in the week ahead. A potent correlation between AUD/USD and the Australia-US front-end yield spread puts the spotlight on relative monetary policy considerations. Established RBA monetary policy bets face next to no threats from scheduled event risk in the days ahead, putting the onus on the Federal Reserve side of the equation. Last week, the Fed delivered what was widely received as a hawkish policy announcement. The central bank upgraded its forecasts for the labor market and inflation trends while Fed Chair Janet Yellen alluded to interest rate hikes as soon as 2015. Indeed, investors are now pricing in 38 basis points in effective Fed tightening over the coming 12 months, while the RBA is expected to fall short of even a single rate hike over the same period. The week ahead brings a host of US economic activity indicators to continue to inform this dynamic. Two separate sets of Consumer Confidence metrics, New and Pending Home Sales figures as well as the Durable Goods Orders report are all on tap. US economic news-flow is finally stabilizing relative to expectations having started to dramatically deteriorate in mid-January, suggesting the soft patch noted in the first part of the year is looking to be increasingly priced in. That opens the door for upside surprises to invariably emerge on the horizon, with any such outcomes helping to further narrow the perceived policy gap and weighing on the Aussie. A busy docket of Fed speakers may likewise provide clues driving the comparative policy outlook. No less than seven central bank policymakers – three of them members of the rate0setting FOMC committee – are due to cross the wires. Much has been made of Janet Yellen’s hawkish lean in last week’s post-rate decision press conference, with many observers suggesting that allowing for the appearance of a palpable policy lean represented a rookie mistake from the newly-minted Fed chair. With that in mind, rhetoric from some of the bank’s other leading officials that supports Yellen’s remarks may point to a purposeful tone shift rather than an accidental one, bolstering QE “taper” bets and weighing on AUD/USD (and vice versa). The dollar eased against the other major currencies on Friday, after posting strong gains in the previous two sessions amid expectations that the Federal Reserve could hike interest rates earlier than previously thought. The dollar rallied on Wednesday after Fed Chair Janet Yellen indicated that the bank could begin to raise interest rates about six months after its bond-buying program winds up, which is expected to happen this fall. The comments prompted investors to bring forward expectations for a rate hike to as soon as March of next year. EUR/USD edged up 0.12% to 1.3793 on Friday, after falling to two-week lows of 1.3748 on Thursday. The single currency was boosted after data on Friday showed that the region’s current account surplus rose to a record €25.3 billion in January. The dollar also slipped against the yen and the Swiss franc, with USD/JPY sliding 0.14% to 102.24 at the close, down from Wednesday’s highs of 102.67. USD/CHF edged down 0.09% to 0.8828. Caution returned to markets as the political standoff between the West and Russia over Ukraine escalated, after the U.S. imposed harsher sanctions on Moscow. The European Union also agreed to wider sanctions against Russia, fanning concerns over the impact on global growth. Elsewhere, the Canadian dollar rose against the greenback on Friday as stronger-than-forecast data on inflation and retail sales eased pressure on the Bank of Canada to lower interest rates. Statistics Canada reported consumer prices rose 0.8% in February, up from 0.3% in January. On a year-over-year basis, inflation slowed to 1.1%, from 1.5% in January. Another report showed that Canadian retail sales rose by a large-than forecast 1.3% in January. USD/CAD slid 0.18% to settle at 1.1220, backing off the four-and-a-half year peaks of 1.1277 reached on Thursday. In the coming week, investors will be looking ahead to U.S. data from the housing sector, as well as reports on consumer confidence and durable goods. China is to publish what will be closely watched data on manufacturing and the U.K. is to publish a report on retail sales. China is to release the preliminary estimate of the HSBC manufacturing index, a leading indicator of economic health. The euro zone is to release preliminary data on manufacturing and service sector activity, a leading indicator of economic health. Germany and France are also to release individual reports. The U.S. is to release preliminary data on manufacturing activity. The U.K. is to release data on consumer price inflation, which accounts for the majority of overall inflation. The nation is also to release private sector data on retail sales. Later Tuesday, the U.S. is to release report on house price inflation and consumer confidence, as well as official data on new home sales. The U.S. is to release data on durable goods orders, a leading indicator of production. The euro zone is to release data on M3 money supply. The U.K. is to produce official data on retail sales, the government measure of consumer spending, which accounts for the majority of overall economic activity. The U.S. is to publish final data on fourth quarter economic growth. The nation is also to release the weekly report on initial jobless claims and private sector data on pending home sales. Japan is to release a series of data, including reports on household spending, inflation and retail sales. In the euro zone, Germany is to produce preliminary data on consumer inflation, while France is to publish data on consumer spending. The U.K. is to release data on the current account and final data on fourth quarter growth. The U.S. is to round up the week with a report on personal spending and revised data on consumer sentiment. The dollar dipped against the traditional safe haven Swiss franc on Friday, paring a weekly gain, amid heightened tensions between the West and Russia over Ukraine. USD/CHF edged down 0.09% to 0.8828 at the close, down from the two-week highs of 0.8868 reached on Thursday. For the week, the pair gained 1.08%. 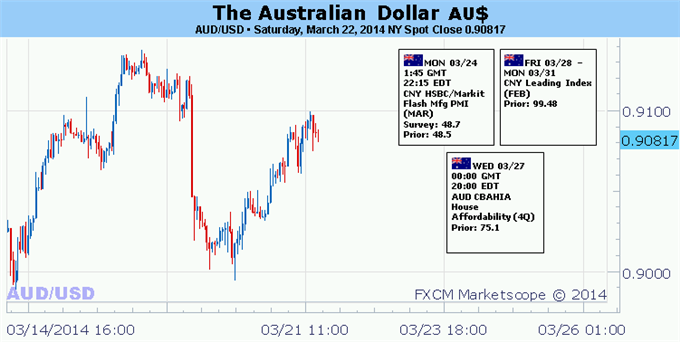 The pair is likely to find support at 0.8750 and resistance at 0.8875. Caution returned to markets as the political standoff between the West and Russia following the annexation of Crimea escalated, after the U.S. imposed harsher sanctions on Moscow. The European Union also agreed to wider sanctions against Russia on Friday, fanning concerns over the impact on global growth. The dollar had racked up strong gains against the franc in the previous two sessions, bolstered by expectations that the Federal Reserve could hike interest rates earlier than previously thought. The dollar strengthened across the board Wednesday after Fed Chair Janet Yellen indicated that the bank could begin to raise interest rates about six months after its bond-buying program winds up, which is expected to happen this fall. Meanwhile, the Swiss National Bank left rates on hold at zero after its policy setting meeting on Thursday and said it was maintaining its exchange rate floor against the euro. The SNB reiterated it would enforce the 1.20 per euro minimum exchange rate floor with unlimited interventions if necessary, and added that it remained ready to take further measures. The central bank confirmed its forecast that the Swiss economy will grow by around 2.0% in 2014. It revised down its inflation forecast, saying consumer prices will remain flat this year and rise 0.4% in 2015. In the coming week, investors will be looking ahead to U.S. data from the housing sector, as well as reports on consumer confidence and durable goods. Switzerland has no economic reports scheduled for release during the week. The U.S. is to release report on house price inflation and consumer confidence, as well as official data on new home sales.